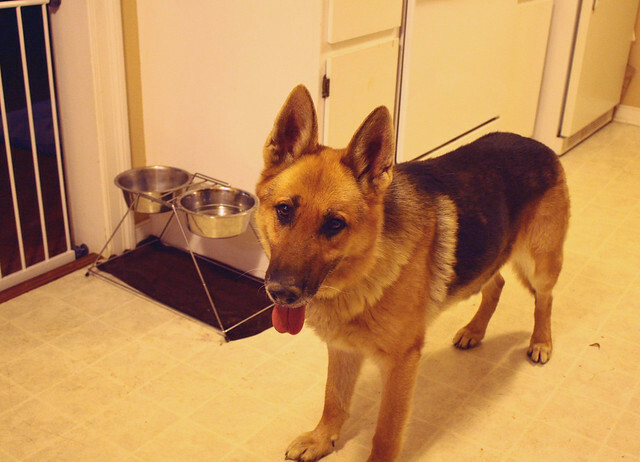 In March 2013, we started volunteering as a foster home for Southeast German Shepherd Rescue. This is a log of current and past dogs we’ve fostered. HISTORY: Surrendered by a young family who didn’t have time for her; bred from West German lines from schutzhund-titled parents. PERSONALITY: Eden is one very special girl. She’s what rescue people like to call “bombproof,” in that nothing bothers her. Edie has personality and confidence in spades! 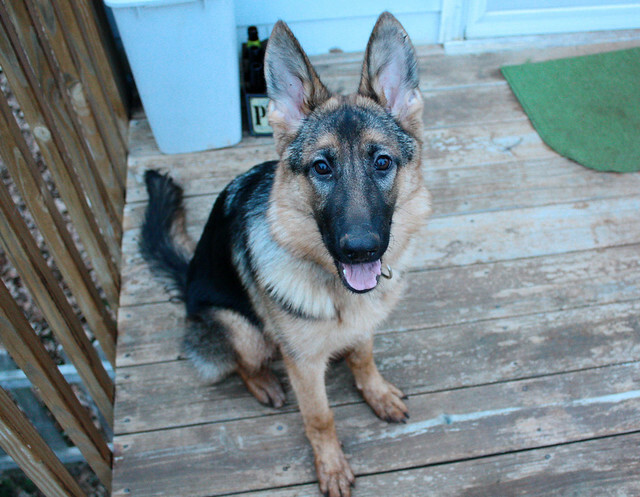 She loves all people, other dogs, and children, and especially loves to play fetch and wrestle with Pyrrha. HISTORY: Dropped off at a shelter in Gastonia, NC, by her owner, citing insurance policy conflict. 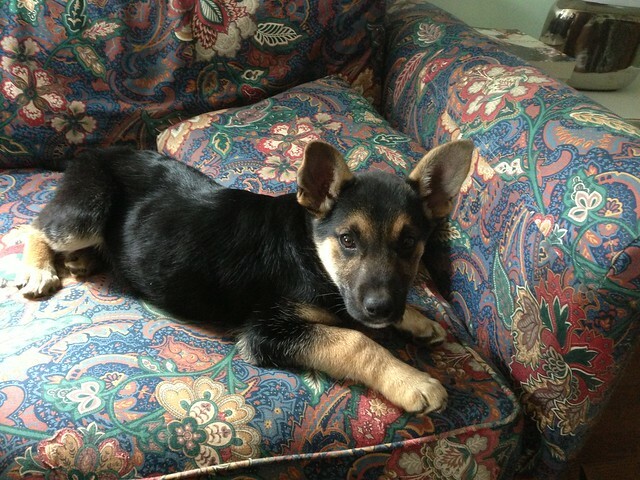 PERSONALITY: Trina is an absolute GEM of a puppy! This girl is very bright, attentive, and people-oriented. She loves playing with Pyrrha, taking walks, and chewing on anything she can find. In short, this is an extremely promising girl, and she’d be an amazing addition to any family. HISTORY: Rescued from an animal hoarding situation in West Virginia, where he was living in a house with 54 other dogs. Yikes. PERSONALITY: Despite his rough start to life, Draco (aka Tyr) is a total sweetheart and cuddlebug. He is initially shy around new people and in new situations, but he warms up quickly. He is so calm and mellow! Draco is great with other dogs, both big and small, children, and even cats. In short, this boy is a gem, and he will make one family very happy! AGE: Approx. 4–5 years old. HISTORY: Found as a stray in Stanley, Virginia. 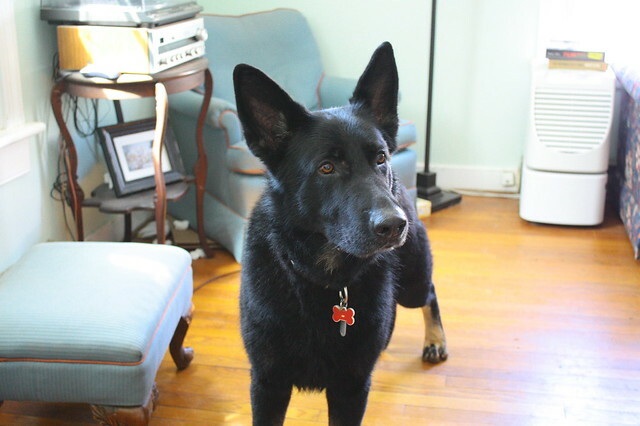 PERSONALITY: Rainer is a sweet, shy, easygoing boy. He is learning how to live in a home and adapting very quickly, particularly for a guy whom we suspect has not lived in a house with humans before. Rainer loves being outside, chewing on sticks, and romping with his foster sister. He is crate-trained and house-trained, and he is learning to get over some of his fears. He will be such a loving, loyal companion to anyone who has a patient and gentle hand. AGE: 8–9 weeks (when he came to us). HISTORY: Thrown over the fence in the middle of the night at a West Virginia shelter; that’s all we know about him. PERSONALITY: Laszlo is a sweet, cuddly little dude. He is slightly shy, but he warms up quickly. Laszlo is especially attracted to people and he always wants to be wherever we are. He is a bit overwhelmed by other dogs, but I think he will get along with them well as he gains confidence. He is still getting housetrained and getting used to a crate, but this guy is full of potential! 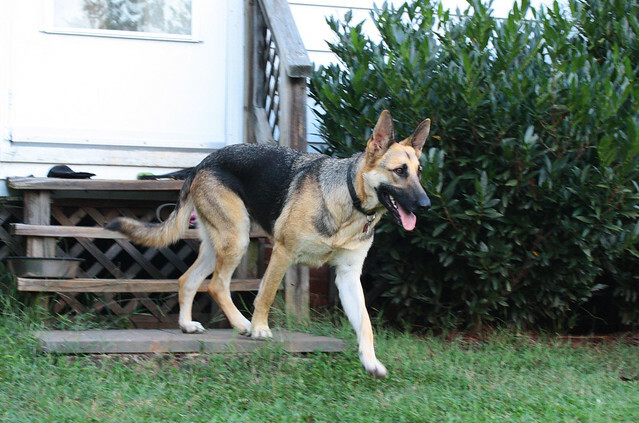 HISTORY: Showed up on someone’s back deck in Louisa County, Virginia; picked up by the local shelter and then brought in by Southeast German Shepherd Rescue. PERSONALITY: He is a LOT of dog! Brando is lovable and affectionate and very attached to his humans (especially men). He is learning how to live indoors and how to stay quietly in a crate; he currently hates being left alone for any period of time and will let you know with lots of noises. Brando gets along well with our young female dog and seems to be friendly to other dogs as well. He does not appear to have ever been walked on a leash before, so we are working on that as well. 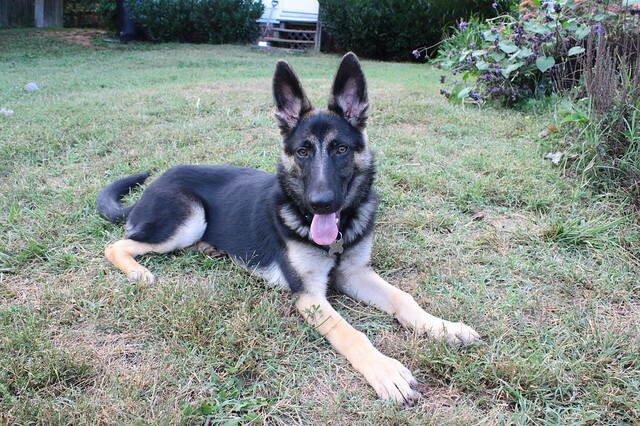 Brando would do best in a home that has German shepherd experience and is capable of providing firm, strong leadership and training. You are the best! Why? For finding it in your heart to foster dogs. Thanks, Marcela! You are sweet!